Choosing a great water heater that doesn’t break the bank can be tough. In a recent article I talked about choosing different types of water heaters based upon the type of fuel it takes to run them. 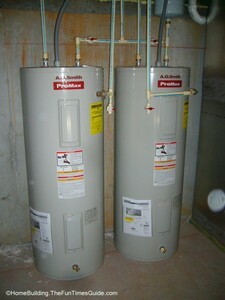 I also mentioned how to choose the best size water heater for your home needs. Now it’s time to talk about water heater life cycle costs. Choosing a water heater that saves you money in the long haul is really what it’s all about. The bottom line. What will be the overall cost of your next water heater? I’m here to tell you that it’s not a tough question to answer if you know where to find the answers (right here). That’s the simple truth of the matter. Let’s get down to brass tacks. The American Council for an Energy-Efficient Economy (ACEEE) lists 9 different types of water heaters along with their life expectancy costs. That’s what you are here for so let’s get the workshop started. As you can plainly see, the efficiency rating doesn’t necessarily correlate with the overall life expectancy costs. The figures mentioned above were derived from energy costs in August 2007. See the ACEEE water heater life cycle cost chart for specifics. Okay…so the EF rating doesn’t sync up with life cycle costs. No worries. Just concern yourself with the overall cost for an apples-to-apples comparison. If you can afford the upfront costs, go with the tankless water heater. They’ve been around for a long time and are markedly improved over the past few years. Demand Gas water heaters have been in much broader use in Europe for a longer period of time than here in the states due to higher fuel costs across the pond. What does that say? It’s obvious to me. When the vast majority of Europe is faced with high energy costs, part of reducing your utility costs is to install the most cost-effective water heater available…a tankless water heater. If it were up to me and I had a property with a south-facing roof with plenty of year-round sun, I’d go with a solar water heating unit with electric back-up. I’m sure that production costs have come down some since late-2007 with increased sales. Not only that, solar energy is available at no cost to you with the exception of the system that is able to capture that energy and put it to use. Oil…try not to depend on it so much. Natural gas is plentiful in the U.S. and we like domestic solutions. Electric water systems are about to make an impact with the advent of heat pump systems. Choosing the best Energy Star water heater system for your home.